Weebly – is a versatile website builder, which allows creating great-looking websites without the necessity to write a single line of code. The website builder comes with a convenient drag-and-drop editor and uses a “box” model, which lets you modify your website structure and design with regard to your web building needs. Launched in 2006 in San Francisco by David Rusenko, Chris Fanini and Dan Veltri, the service has grown into one of the most powerful and well-known drag-and-drop website builders. It has won popularity with over 50 millions of users across the globe and the number of people willing to use it as a major web building tool keeps increasing with every passing year. Such worldwide recognition is explained by the intuitive nature and convenience that allow building quality websites from scratch. This is one of the most user-friendly website builders available in the contemporary niche, yet it’s powerful enough to build visually-appealing websites with excellent performance even without any coding knowledge or web design experience. However, if you are lucky to be aware of CSS or HTML basics, Weebly gives you the option of using this knowledge to build stunning websites. Weebly comes with a powerful blogging and eCommerce functionality, which allows launching online stores and blogs to extend your business popularity. Whatever type of a website you intend to build, Weebly seems an easy-to-use, quick, effective and enjoyable solution both for complete beginners and web design pros. In April 2018, Weebly was acquired by the payment processing giant – Square. As a result, the platform has developed stronger focus on eCommerce, offering an extensive feature set needed to launch and manage small-to-large online stores. But is Weebly really that simple? To find that out, it makes sense to analyze the service in details. That’s exactly what we are going to do right now. The transition to the new editor is seamless, thanks to the Weebly’s quick startup guide and the overall ease-of-use. At the core, it’s the same good old Weebly you know, but with a facelift. The dashboard provides quick and easy access to the information that matters. Get helpful tips, see site stats, store order, blog comments, and more. The editor of the website builder is logically-structured, clear and well-designed, letting the subscribers make use of the extensive and versatile feature set of the service and effectively organize it in unique combinations to gain the desired result. This concerns integration of such tools as image galleries, slideshows, text boxes, product ads, audio and video players, contact forms, custom HTML embedding options, maps integration and what not. The only notable demerit of the system editor is the absence of undo/redo buttons, which results in the inability of users to cancel the edits they make and restore the previously-saved version of the website. The rest of the features and elements of the editor are on a decent level. To build a website, just choose a theme and start adding your content. You can edit and rearrange content by dragging and dropping elements right on your webpage, without having to use a separate editor. Weebly uses a ‘box model’ which means all your content will fall to specific containers or boxes when you drag it to the page. This approach makes it easy to transfer existing content from one template to another in the future. Well-designed and logically-structured website editor. Weebly has a lot of ready widgets and apps you can integrate with just a few clicks, including image galleries, slideshows, maps, audio, search box and more. You can also go beyond the default list of widgets by taking advantage of the ‘Embed code’ option. You can add as many elements to a page as you need. The page itself will get longer to accommodate however many widgets and content you drag on. When adding a new page, you can use one of the ready Page Layouts as an alternative to a blank page. 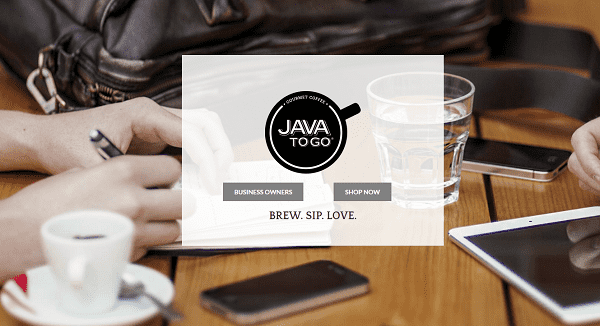 There are over 30 different Layout designs to choose from, including homepages, contact, about, creative menu designs for catering companies and restaurants and service pages, among others. When you choose a layout, it will automatically add new site elements to your new page. 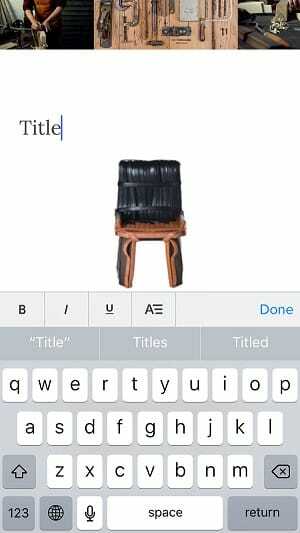 You can then edit, remove or add new elements to the chosen layout. Recently we showcased different Weebly-powered websites, from portfolios to web stores, to show how flexible the builder is. Weebly’s eCommerce engine is chock-full of versatile business-specific features that notably enhance the performance of your online store. These features allow creating functional and visually-attractive web stores in a quick and hassle-free way, without the necessity to use coding knowledge. As soon as you start your Weebly-based web store, the system provides it with an integrated shopping cart, thus, allowing you to start selling your products immediately without wasting your time to handle technical problems. The service also ensures safe payment options and the ability to control your product and material stock. Whether you plan to sell dozens or thousands of products, you will manage them with ease to ensure timely product shipping, boost customer interest in your offers and make clients aware of the recent updates and top selling products. If a user has chosen a product that is out of stock, the system will make it possible to notify him/her when it is available for sale. Weebly also offers powerful and convenient search filter options to speed up and simplify the shopping process. Clients will be able to sort out the products by the major parameters like price, color, type, dimensions and other characteristics. It doesn’t matter, whether you plan to sell digital, physical products or any other services – a flexible product range accessible in the web store will be accessible to current and potential customers, who will get email notifications as soon as new offers become available in the online store. The system also provides multiple settings for physical products, exclusive offers, handmade items, services etc. You can make use of the iPhone and Android apps allowing to manage your business on the go and get in touch with customers from any part of the world. This is a surefire way to keep them interested in your offers. How to Start an Online Store With Weebly? Specify the available payment options. The system will automatically do the rest for you. To enhance your web store building experience, Weebly offers a wide spectrum of unique themes and color combinations, free hosting, various merchandising and product display options, social network integration, advanced SEO characteristics, easy content and product info integration, quick order management options, flexible shipping and payment options, integrated mailouts and what not. Do you have an intention to transfer your Etsy or Shopify web store to Weebly platform? Just import it or upload a CSV file to the service for quick and effective set up. Right after that, you’ll be able to set up your online store design to give it unique look. How to build an eCommerce website from scratch. 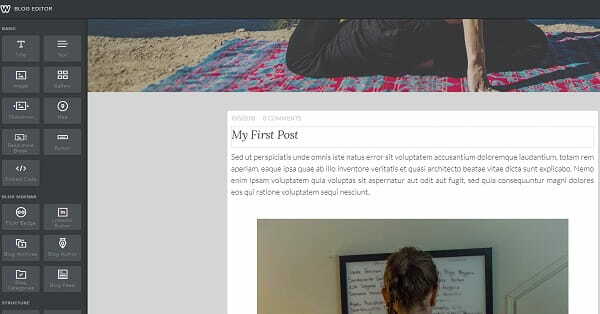 add custom headers and footers to each post and more. Flexible Weebly interface allows creating a blog and filling it with content much quicker than you could imagine. Powerful editing and publishing elements make it possible to focus on the content of your blog, while Weebly services will take care of the background design. 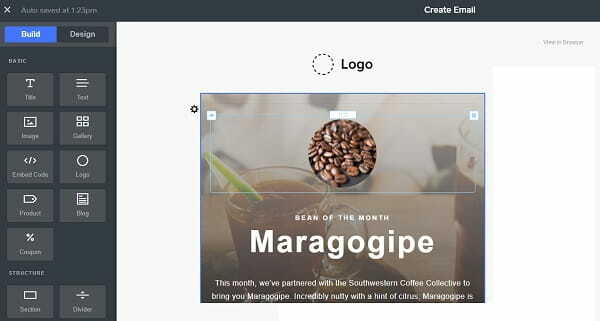 The website builder offers a collection of free blog templates, which can be used independently or as a part of large websites and online stores. Free hosting guarantees fast load speed and availability for users. Blog templates are fully customizable and can easily come up to your tasks. How to start a professional blog. Weebly Promote tool has been introduced for the advanced e-mail marketing options comparatively not long ago, but millions of users have already made sure about its efficacy. The tool automatically generates messages based on the activity of the registered users. Newsletter statistics is tracked in the dashboard section. Weebly Promote service includes a set of ready made templates for various email types, such as bulletins, promo newsletters, product and event introduction etc. These emails will be viewable on all the types of mobile devices, but you should still check the way your email will be displayed. It’s possible to create and save your own templates for future campaigns. What you need to start your email marketing campaign is the list of emails. Weebly Promote allows creating it in two ways – either by importing the emails from the CSV file or by means of one-click integration required to synchronize the contacts with Weebly community groups, web store orders and online form data. Weebly offers a standard set of SEO tools. You can give a unique URL to your page, set up title, description and keywords. This allows your web site pages get higher positions in the search engine results, even though, a week or two may be required for Google to index the changes. Apart from that, Weebly allows setting up and changing the permalinks of all the pages in the corresponding section of SEO settings. Header and footer codes can be embedded into each page separately. You are also able to hide a target page from the search engine just by clicking the checkmark button. Are you going to transfer your website to Weebly from another host? Then the best way to avoid the lost of all the SEO results and history is to set up 301 redirects (if you change a website structure). This is needed to redirect the traffic and the search engines from the old pages to new ones. Weebly allows doing that with ease in the SEO settings section of the system editor. By getting all these SEO features in place, you’ll soon observe the improvement of your website search engine positions. YouTube Integration. This option makes it possible to integrate videos from YouTube and other websites to your Weebly-based website. You can change intervals and display elements by making use of the integrated Weebly video tools and YouTube features that provide extended options for the use of YouTube videos. You can also integrate videos from other video services like Vimeo etc. Weebly video player features ensure professional control over your website multimedia elements. Video Upload and Hosting. 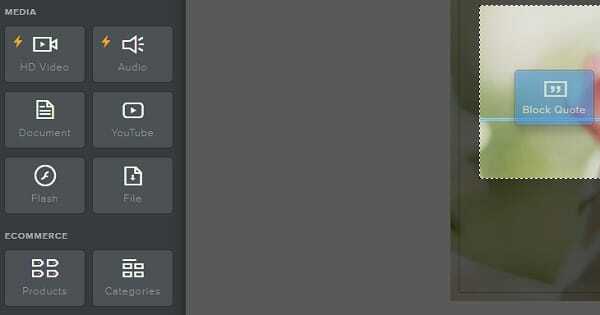 You can also upload video files directly to Weebly. They are automatically converted to display videos from your Weebly website. Users won’t have to download anything or open a separate media player to watch the video. The content can be stored at the Weebly platform for free to be viewed by the visitors in the high quality. With Weebly, you can track your website traffic and manage statistics to define the nuances that require improvement. This data are available at Weebly dashboard and you can find out, how many users visit your website during a particular time interval, what pages they are interested in most of all, what search inquiries drive visitors to your website and from what resources users come to you. What’s important, your website statistics is displayed in the real-time mode, due to what you can track the data and traffic. To analyze web statistics in details, Weebly allows adding Google Analytics code to find out the extended website statistics with minimum effort and time investment. The Weebly system makes it easy to gather and view information submitted by your site visitors. The data is stored on your site’s dashboard and can be easily exported to a spreadsheet for future analysis. You can accept docs, images, or other file uploads from your visitors. Weebly partners with IFTTT, a smart web service that lets you connect various apps and products to easily create automated tasks and events. For example, you can connect your Weebly website and your Instagram account to add a new blog post when you publish a photo on Instagram. You can use existing if-then recipes available at IFTTT Weebly channel, or create your own recipes. 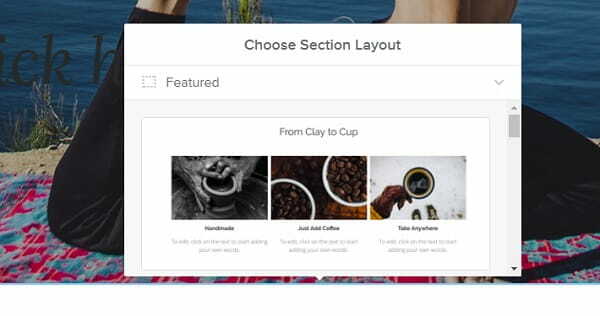 Another bid Weebly’s update from January 2017 is the new Image Editor. Now it’s based on HTML5 (while its previous version was on Flash). 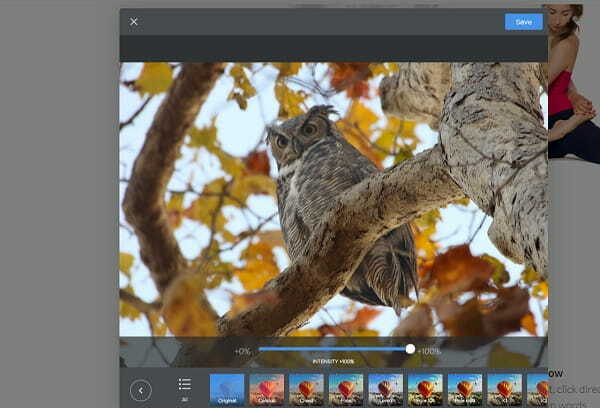 This Editor includes such features as cropping, rotating and adjusting images, adding text to them and offers 29 filters to make images more attractive. 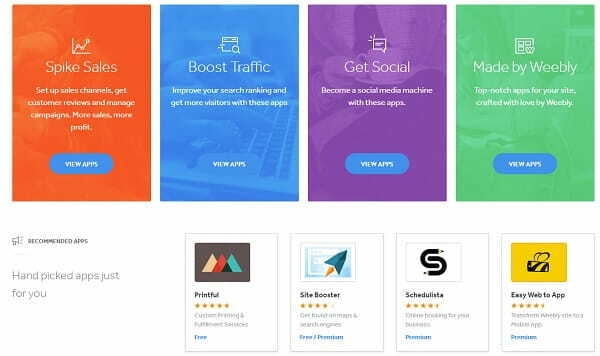 Weebly’s App Center is a dynamic collection of apps and services that you can now add to your site through simple one-click integrations (it’s very similar to Wix’s App Market). PinPoll: this free app allows you to integrate fun and engaging polls into your website giving your site visitors a way to interact with your website and spend more time on it. Each poll can be completely customized with brand colors and images. The app is responsive, so it will look and work great on any device. LiveChat: this paid app lets you integrate live chat software into your website in a couple of minutes. Call-Out-Box: the free app lets you easily emphasize an important piece of information on your site with a custom background and border color. With the release of its fourth version, Weebly expanded their included domain name offerings to include 6 new domain zones, most of which are international. These include .com, .net, .org, .us, and .info, among others. Weebly has an Android and iOS applications that allow Weebly users to create new and edit existing Weebly sites on the go. Their new Weebly for iOS application turns the iPad into a creative tool that works both offline and online, and is specifically developed for tactile site building. Weebly also offers a special solution for teachers and schools. The platform helps teachers easily create classroom sites and even digitize the entire school or college. 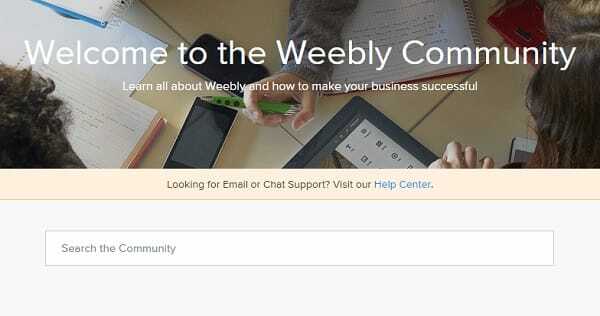 Weebly has made it possible to create custom forms and manage submissions on the web. The drag and drop online form builder of the service lets users create RSVP lists, custom contact forms and surveys to ensure impressive web browsing experience and make projects more engaging and functional. By integrating these elements into your website, you will be able to create contact forms for better data gathering options. This especially works great for websites that target specific or niche audiences (wedding and restaurant websites are the best samples). It’s up to you to customize the newly-integrated form by dragging and dropping the required fields like drop down menus, text or checkboxes, for example. Actually, you can create almost any form type you need by fully customizing questions, response options and extra fields you’d like to be displayed in the contact form of your choice. What’s important, Weebly form builder contributes to simple data storage and access to the available response options. As soon as you are done with the form integration, it becomes available at the website and each visitor may fill it out. After a user provides certain data and submits the form, you’ll immediately get the notification email to the preliminary specified address. For the ease of search and quick review, the data provided will be stored on the dashboard of your website, but you’ll have an opportunity to export it to the spreadsheet for further review and detailed analysis. Mind that the file drop box can also be used to accept photos, documents or other file types visitors will submit. That’s a very handy and useful tool for the owners of large websites with high traffic and rich database of registered users. Weebly also allows building and managing your website from any location you are in by using the mobile apps. The system has special applications for Android, iPad and iPhone, which let you create impressive content everywhere you are. The use of mobile apps does not only let you stay connected to your website 24/7, but also helps you check your project statistics, while browsing contact form submissions without the need to get to your desktop computer or laptop. That’s very convenient and time-saving, especially for entrepreneurs, who are busy all the day long, yet face the need to control their businesses. This is also true, when it comes to eCommerce mobile management. By installing the app, you will get an opportunity to launch and manage a web store to start selling online directly from the mobile device you are using. You can create new product lists, photos, descriptions, product parameters, prices etc. It is also allowed to accept online payments with Stripe, process orders, receive notifications for newly placed orders and perform lots of other useful functions. Powerful eCommerce and blogging platforms. App Center and Form Builder options. 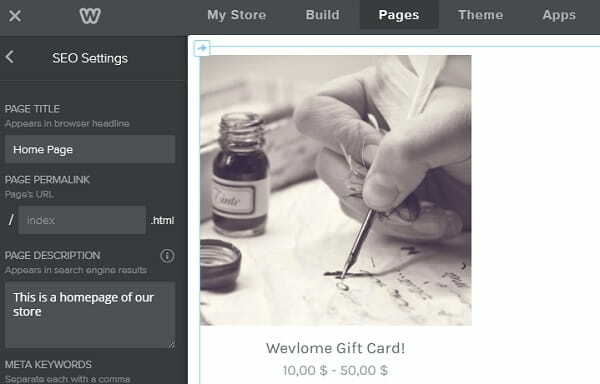 In general, there are three options: you can use a ready theme; customize one (in addition to the standard WYSIWYG builder, there’s an advanced HTML/CSS editor); or use a third party template – there are many designers who create custom templates tailored specially for this website builder. In case you’re using one of the new responsive themes, your website will be automatically optimized for mobile browsing, and you’ll have no control over its look (I mean the look of your mobile version). 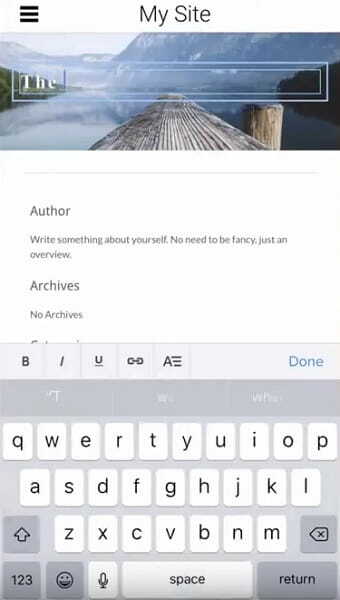 For those using old templates, Weebly provides a built-in mobile editor that is accessible from the Weebly Site Creator. Editing the mobile view of your site is simple with a visual editor that allows you to drag and drop elements into a mobile mockup. Important note: All changes automatically synchronize between desktop and mobile versions, as you remove, edit, or add elements to your mobile website. This feature is available at no extra cost. Weebly provides different types of support. First, the control panel itself contains explanatory pop-ups and prompts to help you easily learn the system. Second, there’s livechat, phone and email support. Should you encounter any problems, first visit the Weebly Help Center. It contains answers to the most frequently asked questions and many helpful tuts. Weebly is also quite active on social media. In urgent cases, you can contact them via Twitter or Facebook. Tips and pop-upda available in the control panel. Livechat, phone and email support. Weebly pricing policy somewhat differs from that offered by the majority of other website builders. It has two separate offers for websites and online stores. Free ($0): implies the use of the major functions of the website builder. Offers drag-and-drop editor, 500MB of disk space, weebly.com subdomain, SSL security. Websites created with a free plan come with the system ads displayed. This plan doesn’t provide any eCommerce options, so, it’s impossible to launch a web store with it. Connect ($4/mo with one-time yearly payment): for personal use. The plan offers all the features of the free plan, but it additionally allows connecting your own domain name. However, the system ads will not be removed from the website. In this respect, Weebly’s Connect Plan is identical to Wix ‘Connect Domain‘ Plan that comes with the same terms. Starter ($8/mo with one-time yearly payment): for personal use. Provides drag-and-drop editor, unlimited disk space, absence of system ads, ability to connect your own domain, SSL security and advanced website statistics. If you intend to choose this option for your eCommerce needs, then the system will charge 3% commission fee for all the transactions made. The plan allows adding up to 10 products and making payments directly at the Weebly website. Pro ($12/mo with one-time yearly payment): for groups and organizations. Offers all the features implied by the Starter Plan plus website search option, password protection, video background, HD videos and audios and an opportunity to engage up to 100 members. When using the plan for your eCommerce needs, you’ll have an opportunity to upload up to 25 products. The payments will be accepted at the Weebly website, while the transaction fee will constitute 3%. Business ($25/mo with one-time yearly payment): or small enterprises and online stores. Apart from the features offered by the Pro Plan, this one also provides an opportunity to engage the unlimited number of members as well as the registration feature. Business plan allows eCommerce website owners upload the unlimited number of products and accept the payments on their own domains. As a result, Weebly won’t charge any transaction fees. The plan makes it possible to sell digital products, manage your stock, offer discount coupons, add product reviews and make use of shipping and tax calculator. For online store owners, Weebly also offers Starter, Pro and Business Plans that come with the same terms as those provided for ordinary websites. Additionally, the service offers the advanced Performance Plan for experienced retailers, the cost of which constitutes $38/mo with one-time yearly payment. The plan encompasses the features implied by the Business Plan. This also concerns eCommerce options, but you will additionally get email notifications about the abandoned shopping carts, shipping prices available in the real-time mode and gift certificates. All the plans offer a domain name (the general cost of which is $19), Google Ads access with a $100 bonus, forum community, live chat and email support. Performance Plan additionally offers email marketing, the general cost of which constitutes $96, and direct tech support in the telephone mode. Pricing plans for ordinary websites and for online stores. Free plan used to explore and test the system. Weebly for education is a project aimed at creating Weebly accounts geared specially for teachers. In addition to the education-specific add-ons, the platform provides the same Weebly features we are used to. To avail the benefits of the project you must be a teacher and the primary use of your Weebly account must be for education purposes. If you violate these rules, your account will be flagged and potentially banned. In the Teacher’s dashboard you can create and manage your students’ accounts which in their turn can also create websites. You can create student accounts either one by one or in bulk – no email address required. Websites created by your students will be under your full control – you can make them publicly viewable or password-protected. This makes Weebly for education perfect for class assignments: when under development, the project remains password-protected; when it is ready – you can easily share it with your class and discuss it. When your virtual classroom is ready, share user credentials with your students (usernames and passwords) and provide them with a login address – students.weebly-dot-com. Now they can create their own sites using Weebly’s intuitive interface and rich feature set. As a teacher, you can disable website editing as well as delete published sites anytime. Weebly for education is absolutely free. Using the platform’s basic functionality, each student can create one site containing up to 5 pages. If you upgrade to PRO ($12/month), each student will get access to all PRO features of Weebly and will be able to publish 10 websites with unlimited pages. You can also get Weebly Pro as a gift by inviting your fellow teachers. You may also want to explore Weebly Campus Edition for districts and schools. This edition allows to digitize the entire campus in an easy and professional manner. Weebly Campus administrators will be able to manage teacher and student accounts from one integrated dashboard (virtual classrooms, student e-portfolios, websites for assigned projects etc.). This scalable solution costs $499/year. You can try it free during a 30-day trial. Powerful platform for web education. Just like any other website builder, Weebly has its list of pros and cons. This means that each person, who is right about to start using the system, should be aware of these specific system nuances to know what to expect of the web design process in the long run. Here they go. ✔ Ease of use with no coding required. ✔ Weebly for Education. ✘ Absence of undo/redo edits. ✘ 3% transaction fee for all sales. ✘ Lack of innovative features triggered by the rapid development of the web design niche. Simplicity and convenience with no coding needed. Weebly for Education and Weebly Campus Edition. Answer: Yes, it is. As long as your website is published to a free subdomain of Weebly.com, you can enjoy the system free of charge. All free Weebly websites have an advert in the footer – ‘Create a free website with Weebly’. It’s noteworthy that this advert is super tiny and nice-looking comparing to what other website builders offer (Wix, in particular). You can create and publish up to 10 Weebly websites within one free account. Question: How to Edit Weebly Website? Answer: Weebly has simple and intuitive WYSYWYG drag & drop site editor. All you need is just to drag selected element from the left panel to your website layout. By adding elements (blocks) and filling them with content you will receive a stunning website in a short time. Question:How to Publish a Website on Weebly? Answer: To make your Weebly website live and accessible to all Internet users and search engines you should make one simple action – to click on “Publish” button in the top-right corner of the site editor screen. Question:Сan You Edit Your Weebly Website After Publishing? Answer: You can edit your website built with Weebly at any time you want. To make this you have to login to Weebly, than select the website you want to change and press “Edit” button. Question:How to Preview Weebly Website? Answer: Weebly is a WYSYWIG Editor. This means that all actions you provide with your website in site editor are visible immediately. You can also switch between Desktop and Mobile website versions and edit both of them. Question:Does Weebly allow to make changes on a code level? Answer: In case you want to go beyond what Weebly offers in its official theme library, you can completely customize the look of your site using the HTML/CSS editor which provides you with a real-time preview of the changes made to the template’s code. Thanks to the technical nature of Weebly, you can create a custom template yourself or hire a professional to draw it for you. Question:Are Weebly websites mobile friendly? Answer: The latest version of the Weebly Site Creator includes a mobile editor which is as easy-to-use as its desktop counterpart. However, though it allows to customize your site’s mobile view easily (using the same drag-and-drop tools), it should be mentioned that there’s no way to create a separate mobile version for your site (like with Duda Mobile). In particular, when you add an element to your mobile Weebly website, it will invariably be shown on your major website, too. Question:Can I build an eCommerce website with Weebly? Answer: Yes, you can. There’s a native eCommerce platform allowing you to sell both digital and physical goods. It has an impressive set of customizable properties: filtered product search, tax control, coupon codes, mobile store and checkout etc. 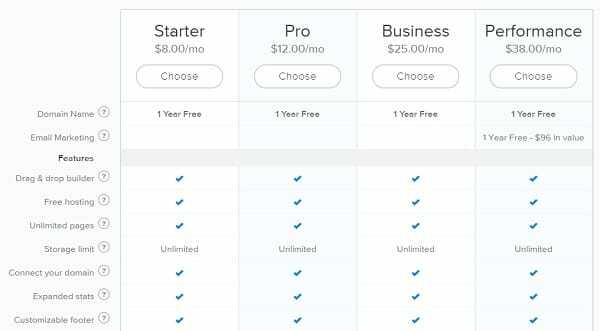 The Starter ($8/mo) and Pro ($12/mo) plans let you sell a limited number of products – 10 and 25, respectively. Within these plans, a Weebly transaction fee (3%) is charged. The Business and Performance plans come with unlimited products and no Weebly fees. Question:Does Weebly offer any membership features? Answer: Pro, Business and Performance users can activate a registration option for their site to allow site visitors to sign up to become members. You can add members, manage them in groups and control which pages they have access to. You can set up different group preferences to allow page access for managing and editing your site. Question:Can I edit my Weebly site using a mobile phone? receive notifications whenever a new order is placed. Weebly also has an application for Apple Watch. It lets you monitor website traffic, manage blog comments and even check store orders and inventory right from your watch. Question:Can I change a theme of my Weebly website? Answer: Yes, you can change your website theme as many times as you need. In our review we’ve mentioned that Weebly is a ‘block based‘ website editor. And the key feature of such model is the ability to change your website template without loosing content. All Weebly designs are fully responsive and mobile friendly, and with template change your websites will look the same perfectly. Question:How much does it cost to use Weebly? Answer: Weebly offers a six different plans of using. One of them is for free, the rest are paid. With a free plan you can create a simple website without possibility of selling goods or services. Besides, in this case your website appears with Weebly ad banner at the bottom. Paid plans range from $8/mo to $38/mo. The full-featured plan for eCommerce starts from $25/mo. Question:What can I do with Weebly? Answer: Weebly is a versatile website builder. With its help you can create a website of almost any type you need. As a proof of my words you can see my collections of handpicked Weebly-powered blogs, e-stores and other types of websites. Besides, with Weebly you can create amazing wedding websites. Answer: With its generous free version and affordable feature-rich paid plans, Weebly is one of the most reasonably priced site builders in the market. It’s easy-to-use, secure and fun. Weebly also has various themes for any kind of website you need: business, online store, blog, portfolio and others. If you have any more questions about how to make a website with Weebly, its powerful Help Center and Community always help you to find the right answer. Weebly is a user-friendly cloud website builder, which comes with a convenient drag-and-drop editor, abundance of design customization tools and quality templates. The service is a great choice if you’re about to build a small or a medium-sized website that doesn’t require any sophisticated functionality. There is no need to use coding skills to launch websites with Weebly. However, users, who have CSS/HTML knowledge and web design expertise, can use it to create and manage personalized projects with the system. The website builder offers powerful blogging and eCommerce engines, making it possible to build decent web stores and blogs. The advanced Weebly Promote tool will help you effectively design and advertise your website on the web, making use of multiple marketing and SEO options the system provides. Another highlight of the service is its Weebly for Education project, which comes with education-specific add-ons and enables teachers to create educational websites with ease. This is the feature that is not available in lots of other popular website builders. Does Weebly come up to you web design tasks and needs? To find that out, it makes sense to test the service and explore the entire feature set it offers. You can do this for free now to draw the unbiased conclusion.